I decided to try something new with my nails because I’m getting bored with having my nails one solid colour. Here is something to try that’s really fun and easy! To achieve this look, first paint your nails your favourite colour – wait for them to completely dry. Then take small pieces of tape and press them over the area of your nail that you don’t want to change colour. Then, take your next colour and carefully paint over the exposed part of your nail. 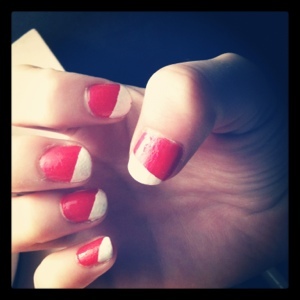 Let the polish dry to the point of just being tacky, and slowly pull the tape of in the direction of your stripe. Do one finger at a time so it doesn’t get messy – start at the pinky and work your way towards the thumb. After all of your nails are totally dry – put on a layer of top coat!